Richard Moses (right) at LESPI’s birthday bash. At a meeting on Tuesday, the Landmarks Preservation Commission may well create a new East Village/Lower East Side Historic District encompassing over 300 buildings. 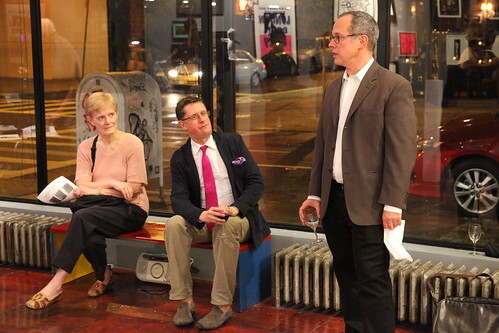 But the Lower East Side Preservation Initiative isn’t waiting till then to celebrate: the group marked its fifth anniversary last night with bubbly and birthday cake at Smart Clothes Gallery on Stanton Street. Since preservation architects Richard Moses and Britton Baine – inspired by a screening of “Slumming It: Myth and Culture on the Bowery” – started the organization in 2007, they’ve gone on to become instrumental in the creation of a 10th Street Historic District and have led countless tours and discussions about neighborhood history and architecture. The Local chatted with Mr. Moses as he prepared for last night’s birthday bash. You’ve garnered opposition from religious groups in the community in regards to landmarking. Have others opposed your projects and how do you handle the situation? There were a few property owners who were opposed. They came out and expressed their opposition, but there wasn’t a huge number of them by any means; I would say a few. It’s a tricky situation because emotions tend to run high on both sides. Certainly we’re sympathetic to concerns of religious institutions on the idea that they want their congregation to be thriving and we certainly want them to be thriving – we don’t want them to burdened. We feel sometimes that there’s a misunderstanding of some of the requirements of the Landmarks Commission and that there’s a different focus on short-term versus long-term goals. Some of the religious organizations, quite frankly, wanted to develop their properties, take down their religious buildings and build up high-rise luxury condos. And at least two of the three of the loudest opponents of the Landmark District had previously filed for demolishing their buildings and putting up high-rise luxury condos. We’re thinking of the broader community and the city, in this case. What are some of the bigger challenges you’ve faced? One of the frustrations we’ve had is that we feel sometimes the property owners will just jump in and strip their buildings of ornament as soon as they hear that landmarking may be coming their way – and we feel that’s kind of selfish behavior in terms of not really having a lot of consideration for the community at large. That happened with a few buildings on the south side of Sixth Street and Second Avenue, where a historic building was torn down, reportedly by David Schwimmer, the actor. What are your views on rooftop additions – are they really a huge concern the public should be aware of? It really depends on the rooftop addition. First of all, it’s not visible from the street, it really seems like it’s a non-issue. And even if it’s minimally visible from the street, I don’t really see it as a significant issue. It’s when it either starts to become either significantly visible or prominent. The worst situation is when a developer comes along and rips off the cornice – the molding on top of a building – and plops the addition right on top of the historic building without any regard whatsoever for its original architecture and design. What are your thoughts on the current situation with the Merchant’s House? What are some influential forces of change and preservation for L.E.S.P.I.? From a negative perspective, I think that it’s the unrestrained development and the overdevelopment of the neighborhood, which has been gentrifying over the years. Thirty years ago it was not a wealthy neighborhood to any extent; now it’s become a wealthy neighborhood. There are a lot of really unfortunate social effects that come with gentrification but from a preservation point of view, what we’ve seen is really just unrestrained development and developers knocking down buildings left and right – beautiful historic buildings that tell a story of the city and neighborhood. One of the really sad cases was the demolition of 35 Cooper Square – that was a building that told a story of the city. The developer just came in and took it down. Now we’ve had a vacant lot for two years – it’s really very, very sad and not sensitive to the neighborhood or I would say even the entire city. It’s a kind of slap at the city and all of our shared heritage. What is L.E.S.P.I.’s most current work in progress and why is it important? The Lower East Side was considered in 2008 by the National Trust for Historic Preservation one of the country’s 11 most endangered places. So it just shows that this area has national and international importance because people came from all over the world to live here and they left families behind – so it was something that is really an entire world of experience – this one community here. On Tuesday, if the EV/LES Historic District is passed, then we’ll at least have some of the East Village protected; but below Houston Street there really is nothing at all that’s protected – so all of that will vanish if we don’t move quickly to have it landmarked and preserved. What do you see in L.E.S.P.I.’s future? We just started last Saturday our survey of the Lower East Side below Houston Street – there’s still areas of the East Village that we want to have landmarked. We would really like the Commission to look very carefully at St. Marks Place and the blocks north of St. Marks – Ninth and 10th and 11th Street – and then more of the area around Tompkins Square Park. But we also want them to move very quickly to the Lower East Side below Houston Street. Every day that these historic buildings are left without protection we lose more of them. And the unfortunate thing is that the Landmarks Commission really wants continuous groups of impact buildings – so the damage really makes it much harder to landmark.